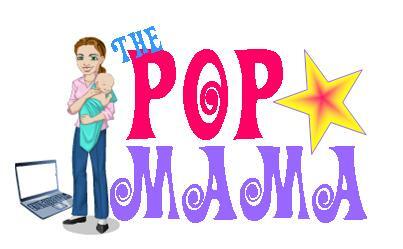 Pop Mama: Making My List. Everyday when I open up my mailbox I am amazed at how many trees were killed to bring me the catalogues I NEVER ASKED FOR. I understand the marketing strategy of sending a catalogue to everyone who ever bought anything from a catalogue or website, or somehow got his or her name on some kind of mailing list, but the strategy is wasted on me. Basically I buy everything on either: Amazon.com, websites or in the actual store. It is rare that I see something SO special in a catalogue that I have to buy it, so please stop sending me wasted paper that goes into the recycling bin straight out of the mailbox. With that being said, yesterday I got a catalogue in the mail that made it past the recycling bin based solely on its name -- Magic Cabin. Has anyone else seen this one? It looks kitschy with a photo of elfin dolls on the front, but seriously, Magic Cabin just sounded magical to me. Turns out, it is pretty damn magical. Magic Cabin carries just about everything a child would need to pretend that he or she lives in a land full of fairies, elves, forest people and woodland creatures. It.Is.Awesome. Even my husband appreciated how cool it is. Classic Cloaks -- just what they appear to be...in "Floral Pink, Little Red Riding Hood, Celestial Blue, or Teal Leaves." I'm asking Santa for one in Teal Leaves. 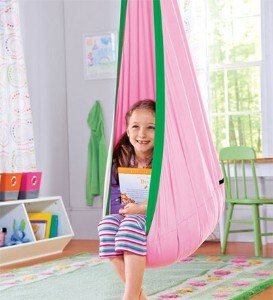 HugglePod -- a hanging cocoon for kids. It holds up to 175 lbs. so I should be good. See below. Play Silks - let your imagination run wild. Kirin the Unicorn - yes, please! Bilibo - literally the description says "It's whatever a child wants it to be!" Ladybug Thumb Piano - for making fairy music, of course. I reviewed this catalogue more carefully than I have reviewed legal documents and I was entranced. Where was this mystical vendor when I was a child? If I had seen this catalog when I was a kid, I would have gone ape and probably circled every single thing it as a "need." Call me a nerd, but I was pretty upset that the Harry Potter series didn't come out when I was a kid. It would have seriously changed my childhood and probably would have made for more than a few Hermione Halloween get-ups. I mean, I already had the hair. My co-worker says thanks for the website. She has already found tons of things she wants to buy for her son!